Let’s learn how our money system affects human cultures and human behavior. Then, we have an opportunity to return to sustainability and prosperity through changing just one thing! This summary will get you ready to learn more. I. Where are we now? The current money system is a mess. These problems are intrinsic to the very system that the world is now using. By changing the type of money we use, we can change many things about our economy and our society. Wealth stays in local communities, rather than being sucked up by cities and governments. Changing just one thing could cause massive benefits to global societies. How about a definition? “An agreement to use something as a medium of exchange”. Fiat Money—All national money is Fiat money—made from nothing, backed by nothing. Cryptocurrency—The good and the bad about Bitcoin. Using cryptocurrencies not just as media of speculation, but as media of exchange and stability. Complementary Currencies—IF we didn’t need them, why do we have 4000 of them? Mutual Credit Systems—Anyone can play! No money needed! Worgl—Saved the local economy—until the central bank found out! III. How could a money system change human behavior? The shadow causes us to unconsciously express that which is hidden within us. It is possible to change the way shadows express in our lives and in society by changing from scarcity and greed mindsets to an abundance mindset. 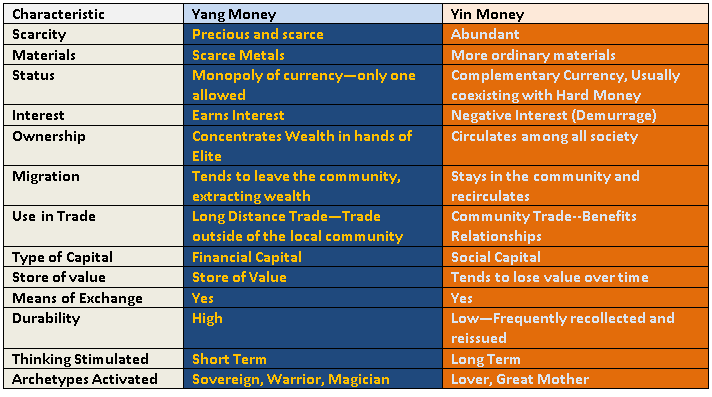 Yang money has certain traits. This instability activates the Magician archetype to come up with more and more complicated means of controlling the economy. In the West, we focus on more and more efficiency, like a monocrop cornfield or pine plantation. But a pine plantation is very susceptible to disease or fire. Similarly high density animal feeding operations require constant antibiotic use to ward off infection. Monocultures of anything are efficient, but not resilient. Natural forests and other ecosystems have many species, interacting in a manner which protects against disease and natural forces, and provides resilience. In the same way, our money system has only one type of money. 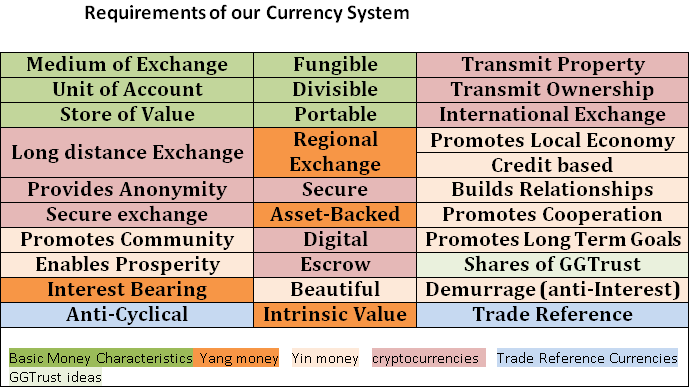 Create a system incorporating both Yang (financial capital) and Yin (social capital) currencies. Back this money with assets. Create the money as Assets, instead of Debits like the national currencies today. Create the money in a number of interchangeable forms. By the use of demurrage, it may be possible to increase the wealth of the community by more than TEN TIMES the original amount, just by using this small usage fee! Use small discounts to make it easier to enter into the Yin currencies, and small charges to discourage exchanging out of the system. International Terra-like Trade Reference Currency provide countercyclical balance to world trade. A fee to convert GGCurrency to national currency will tend to keep the GGCurrency in circulation, as will demurrage charges. A discount to convert national currency into local GGCurrency will also tend to bring value into the GGCurrency system. Demurrage will be established on local currency to increase the velocity of its circulation. It may also be applied to the Trade Reference Currency.